With each passing year, the lessons of the Holocaust grow fainter in the world’s memory. As fewer and fewer survivors are left to share their powerful testimony, finding new and engaging methods to preserve, transmit and understand their stories has become crucial. For Dr. Karen Shawn, associate professor of Jewish education at Yeshiva University’s Azrieli Graduate School of Jewish Education and Administration, that is a sacred mission. 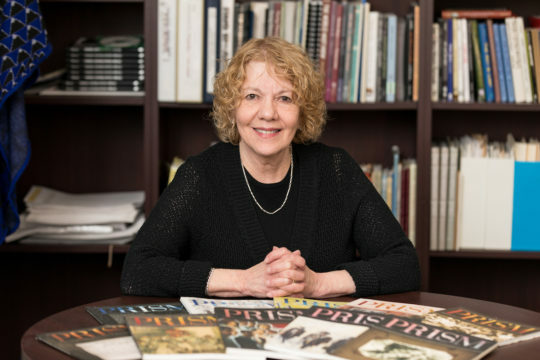 Dr. Shawn is the editor of PRISM: An Interdisciplinary Journal for Holocaust Educators, published by Azrieli with support from the Rothman Foundation. Now in its 10th year, the peer-reviewed journal offers educators a practical scholarly resource to teach the Holocaust to students from high school through the graduate level. Each issue examines a specific topic through a variety of lenses, including education, history, literature, poetry, psychology and art, and with insight from key experts in the field. On Yom Hashoah, YU News sat down with Dr. Shawn to discuss PRISM’s evolution and unique perspective on Holocaust education, and why it is more important now than ever to study closely one of the darkest times in Jewish—and human—history. How did you become interested in the field of Holocaust education? I have no personal connection to the Holocaust; my family left Russia three generations ago, so I am unaware of who among my extended family was murdered in the Holocaust. But I began my education of this subject many years ago in depth at Yad Vashem, with survivors, as well as with the world’s best historians, as my teachers, mentors, and guides. These survivors, who included the late Benjamin and Vladka Meed, became my dear friends over the many years I learned with them and, eventually, taught in the yearly summer seminars they ran in Israel. They urged me to make this work my life-long focus of study and teaching. I took their words seriously, and I have been learning and teaching about this subject in their honor and memory for 28 years. Where did the idea for PRISM come from? Until it ceased publication, I was a contributor to the journal Dimensions, edited by Dr. Dennis Klein and published by the Anti-Defamation League’s Braun Holocaust Institute, Glick Center for Holocaust Studies. I knew how important that journal was to historians and educators, and when another contributor, Dr. Jeffrey Glanz, came to work at Azrieli, I suggested that we publish a journal to address the need that Dimensions had filled. He agreed, and acted as assistant editor until he made aliyah several years ago. Dean David Schnall fully encouraged and supported our project, and Henry Rothman and the Rothman Foundation funded it so generously that we were able to avoid including advertisements and we were able to send it to readers requesting it at no charge. Despite the rising printing and mailing costs over the years—and we have requests from readers in 43 countries and in every American state—the Rothmans’ wonderful gift enables us to continue this today. 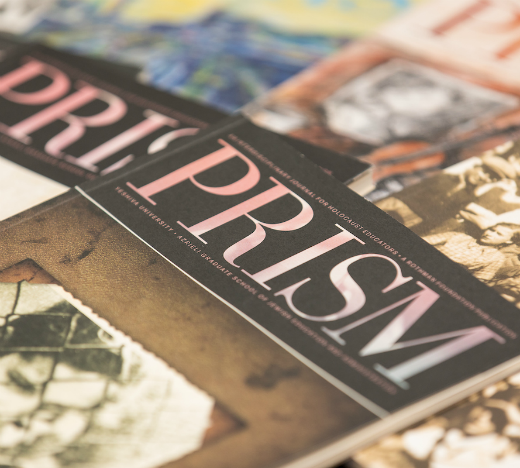 PRISM is interdisciplinary, including art, poetry, testimony, and short stories along with essays on pedagogy, history, biography, psychology, and sociology. It boasts the work of both world-renowned and emerging scholars; it is stunning, produced on high-quality paper in full color; and it is scholarly and yet fully accessible to high school students as well as college and university students, professors, researchers, and lay readers. Its tiny staff is uniquely qualified and generous. Dr. Moshe Sokolow is associate editor, and Emily Scherer Steinberg is our art director, the brilliant layout and design person. I am blessed to have Dr. Charles Ades Fishman, professor emeritus at SUNY, as poetry editor, and Dr. Pnina Rosenberg of the Technion as art editor; both of these remarkable educators give freely of their time and talent as a labor of love because they believe so deeply in the quality of the product we produce and the contribution it is making to the field. We also have an advisory and an editorial board consisting of some of the best scholars and educators in the field, including Dr. Klein, now a professor at Kean University. I am also blessed to have the full support and encouragement of our current dean, Dr. Rona Novick. In what ways does PRISM engage students and educators and help them develop a richer understanding of the Holocaust? 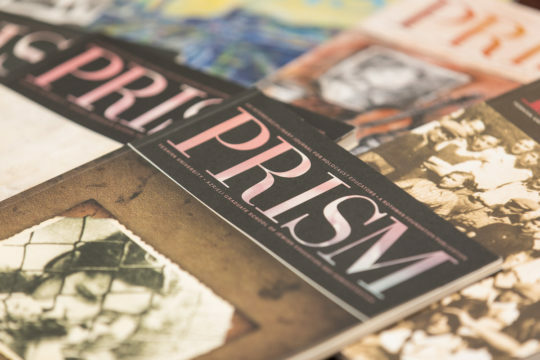 PRISM is important in the field of Holocaust education because there is nothing like it, and because every story, poem, and essay we accept is highly useful, engaging, informative, and appropriate in every classroom setting from high school through adult learning. The journal is peer-reviewed, so the essays are all factually correct and meet strict standards. Each issue takes one theme and examines it from a variety of disciplines and perspectives (hence the title), so readers get a broad spectrum of ideas to help them learn in depth about one particular aspect of the subject under discussion. It is never graphic; we never overwhelm our readers with the brutality of the events. It is sensitive to Orthodox readers in its essay content, photos, and art works. Our essays, many written in the first-person voice, are short and illustrated with historical photographs and thus very classroom-friendly. Our online version is fully downloadable, so teachers can make copies of the pieces they want to teach in any given unit of study. In all your years as editor of PRISM, what story or unit are you most proud of? Why? I cannot choose one story or unit of which I am most proud. In fact, any number of people have been urging me to make a “best of” anthology from our 10 issues, and I am unable to choose which stories and essays—or even the gorgeous covers!–are the best of any given issue. I love them and I’m proud of them all! What topics does the newest issue address? Our 10th is one of two unthemed, “open” issues. Several years ago, we offered contributors the chance to submit an essay on whatever subject they pleased, and we got so many wonderful submissions that we decided to do it again for this issue. However, we do have a concentration this time on the subject of using artifacts to teach about the Holocaust and the people who owned them. The unit, which consists of an essay, poetry featuring artifacts and illustrated by the artist Nancy Patz, and an analysis of the illustrations, is 28 pages, and we decided to excerpt it as a separate booklet that we could mail at less cost than the journal and thus allow educators to order multiple copies for use in classes and conferences. This is our first stand-alone excerpt, and it was generously funded by Elaine Marton Diller and The Michael and Sarah Marton Family Foundation, for which we are extremely grateful. We cannot keep up with the demand for it. Why is Holocaust education so important? I think this education is one of the most important learning experiences we can offer. It has within it the seeds of every essential question that one must ask if one is to live an examined life. We cannot be the same in the world after learning about it. We all live in the shadow of the Holocaust, and trying to understand it and its ramifications is imperative if we are to try to understand and help to heal the world in which we live.